Welcome to RCAN (Retail Collection Attorney Network). We very much appreciate your decision to advertise on the RCAN Network. RCAN is the only retail collection attorney network that can put its members and advertisers in front of nearly 30,000 Credit and Collection Industry professionals in our daily opt-in email advertising campaign and exposure on the Collection Indutrsy News website with 1.5 million page views monthly. In addition, we have many high exposure internet portals that we use to cross market the RCAN Network throughout the world wide web. Search engine positioning is a key factor to advertising on RCAN as well. We have the best SEO team in the Collection Industry on staff, who also happens to be one of the founders of RCAN, Collection Industry News, and Top Ten Marketing amongst many others. All pages in the RCAN Network are optimized by our webmasters in order to give every law firm and vendor tremendous exposure on the internet. You can attract prospective customers with your own custom made sponsor box ad for just $100.00 per month for our attorney state pages and vendor pages and just $50.00 for our attorney city pages. All ads must be paid by credit card monthly or for full term of ad. If you have something else in mind, please contact our Florida office to discuss at 800-648-1914 ext 217. All ads are for an initial 6 month term. 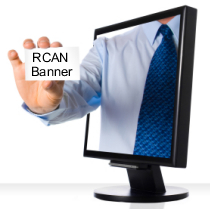 Should you have any questions regarding the placement of an ad on the RCAN Network, please contact either office of RCAN and we will be happy to assist you in any way that we possibly can. Below is our print and fax Banner Advertising Agreement. Please print it out, fill in your information, sign it and fax it to 561-995-9678. Copyright © 2007 - 2010 Retail Collection Attorney Network - All Rights Reserved.